Through JS I met the most talented and charismatic people who influenced me in my later life. 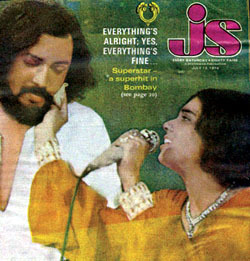 The JS Blueprint brought out the works of Pritish Nandy, still a struggling poet during that time. He had started his poetry journal 'Dialogue' which was even publishing poetry of Underground Poets in the former Soviet Union. I was surprised to find that some of Dialogue journals are still available at Amazon. I always wanted to do something like that. But most of all was its Editor, Desmond Doig, Artist, Poet, Writer, Yeti Hunter, a human being with such qualities that remains superlative till today. His works can be seen at the Shangri-la Hotel that he helped to build in Kathmandu, Nepal. Thanks to JS, we still happen to be the world's oldest teenagers. The saddest part I believe that my children would never be able to enjoy a cult movement that took us all by a storm. Where can I get a copy of the old JS magazine. Love to get one, even just to browse thru a copy.